Duck Dynasty and Phil Robertson’s supporters have found a new way to duck the halls this holiday season. 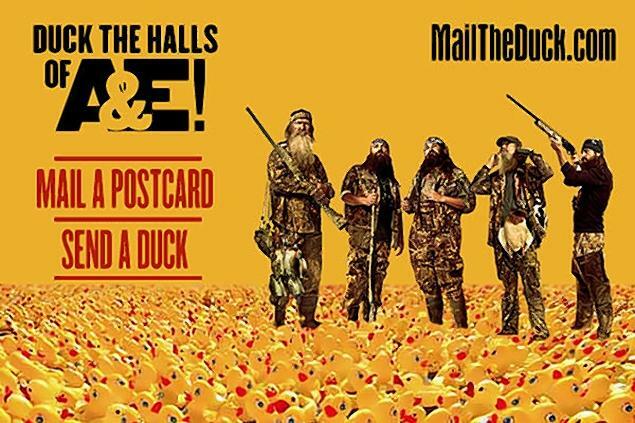 The Mail The Duck campaign is sending A&E thousands of tiny yellow rubber ducks to show their support for Phil Robertson. Conservative Christians are showing solidarity with embattled ‘Duck Dynasty’ patriarch Phil Robertson by sending thousands of tiny rubber ducks to A&E’s New York offices. The first cardboard box jammed with 1,500 ducks will be sent to the channel’s CEO Nancy Dubuc, according to Janet Porter, the founder of the conservative group Faith2Action. Janet Porter said she was looking for a “tangible” way to show A&E that thousands of people support Phil Robertson’s views on homos**uality. Rick Scarborough, president of the partner organization Vision America, came up with idea to organize a “Mail The Duck” campaign. The goal is to fight back against a “homos**ual agenda” that conservatives believe is “steamrolling” over their rights to freedom of religion and free speech. Janet Porter, president of Faith2Action, said she plans to send the ducks in several batches. She’s already gotten at least 1,500 requests. The campaign was launched on December 23 and Janet Porter says she’s already gotten thousands of requests to sponsor ducks and send free postcards. Phil Robertson, 67, was suspended from Duck Dynasty show after making anti-gay remarks during an interview with GQ magazine. A&E Networks decided to reinstate Phil Robertson after a week of controversy.